Standing next to the 1971 280 SE, the 2016 Mercedes-Benz S-Class Cabriolet shows just how much the company has advanced in the last 40 years. It’s been 44 years since the Bavarian company has released the S-Class convertible, but the 2016 S-Class Cabriolet is one worth waiting for. The 2016 S-Class Cabriolet is dubbed as the “most comfortable cabriolet” in the world and the first picture, released by Mercedes, sure proves the premise. The convertible is trimmed in the cream of the crop luxurious materials, with multiple features to make the life of the driver and passengers as easy and comfortable as possible. The first official image follows a sketch that was revealed last week. 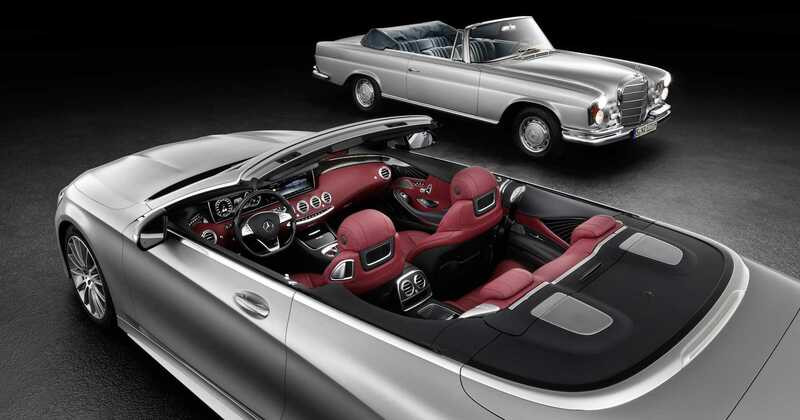 In the picture, the S-Class Cabriolet is pictured in the red leather cabin, with silver interior. The Bavarian company will release the new convertible during next month’s motor show in Frankfurt and fans cannot wait any more. The 2016 Mercedes-Benz S-Class Cabriolet will be in the same segment as the Bentley Continental GT Convertible and the Rolls-Royce Dawn. When the Bavarian company announced the convertible, they said the intention was to make the “most comfortable cabriolet” and surpass the Bentleys and the Rolls-Royces of the world. The interior of the S-Class cabriolet features the popular Aircap automatic wind protection system, enhanced with the neck heating system, as well as heating for the armrests, the rear seats and much more. The 2016 convertible also has fully automatic climate control. The exterior of the 2016 cabriolet is based on the same platform as the 2016 S-Class Coupe. Mercedes is expected to release three versions of the 2016 S-Class cabriolet, the standard S500, as well as the AMG S63 and the S65. The S500 will be powered by a 4.6-liter V8 engine, with the S63 AMG getting a 5.5-liter engine. The cream of the crop is the S65, powered by a twin-turbo 6.0-liter V-16 engine. The S-Class cabriolet will cost more than its Coupe sibling. For comparison, the standard S500 coupe is priced at $319,000, with the AMG S63 costing $409,000 and the S65 priced at $499,000. Future owners could also expect an S550 and an S600 version, given that Mercedes would like to outmatch the upcoming Rolls-Royce Dawn.